Perfect size for an over-the-road truck driver. Doesn't take up too much room. Gets the job done fairly quickly. I needed a small coffee maker for our very small kitchen and I thought the stainless pot would be more durable. 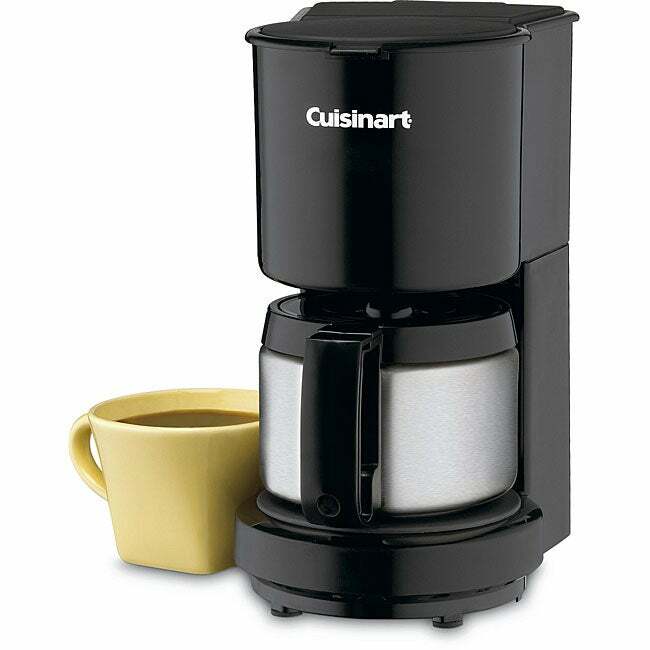 The unit is small and the pot is durable, it has a automatic shut off and the coffee is flavorfull. BUT I have yet to pour the coffee w/o dripping alot on the counter. I hate this pot! My $3 yard sale Mr. Coffee is better then this coffee maker. I got this coffee maker from XXXX. It works well ,automatically turns off and coffee is enjoyable hot . My big concerns about this coffee maker is:1- you MUST pour coffee in your cup over your sink otherwise its IMPOSSIBLE to avoid to not making mess all over your counter top!!! Thats the killing part. 2- Its oven metal has been made by poor quality metal ,get rusted and bumpy after 6 months using. I bought it in red first, the spout dripped terribly. I thought it was due to the fact it was refurbished ($3 off). Sent it back and replaced with a new, black version. Spout drips. Must pour over my white sink, which I like to keep white, not coffee stained. Don't like having to give friends instructions on pouring coffee. Will send the black one back as well. The red was very stylish on my charcoal gray countertop. Wish it poured better. Will look for another brand, as I give up after 2 tries with this brand. use this one if you have lots of time to wait ,very slow, average brew time at about ten minutes.plug in gets hot ! I wanted to buy this for my husband. The color was great color, and it would have fit nicely on the counter for weekend coffee. This appliance had a plug made for a cigarette lighter. It was not a regular light socket plug. When I read the description, I did not see the electrical requirements. Therefore, if you go camping or have a cigarette lighter plug in your car its made for you.